This compendium has followed DSM-III or DSM-III-R in using a multi-axial approach to mental as well as somatic disorders in their clinical description. Thus, Chapters 2–4 have referred to axis 1 (mental disorders), Chapter 5 to axis 2 (personality disorders), Chapter 6 to axis 3 (somatic disorders), Chapter 7 to axis 4 (psychosocial Stressors), and Chapter 8 to axis S (social functioning and coping with illness). 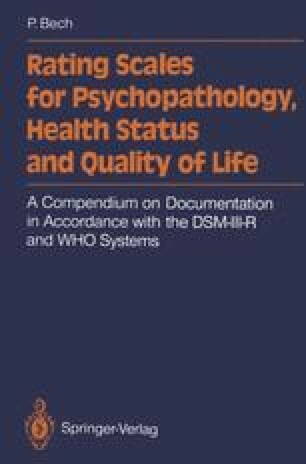 Chapter 9 deals with quality of life, which has no direct reference to an individual DSM-III axis. Quality of life is an integration of all five axis, is a hollistic concept, which has a close relationship to the concept of global improvement of illness during treatment as experienced by the patients themselves (Bech 1990a). In other words, health-related quality of life is a metaconcept which, inter alia, includes coping with illness.